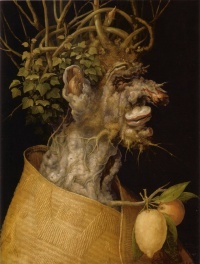 The Winter (1563) is a painting by Giuseppe Arcimboldo. It depicts a lateral view of a human head. The head is composed mostly by the roots of the trees. Some foliage from evergreen trees and the branches of other trees are hairs while a straw mat is the coat of the human portrait. It is in the collection of the Kunsthistorisches Museum Wien. Unless indicated otherwise, the text in this article is either based on Wikipedia article "The Winter" or another language Wikipedia page thereof used under the terms of the GNU Free Documentation License; or on original research by Jahsonic and friends. See Art and Popular Culture's copyright notice. This page was last modified 07:25, 26 September 2012.